Today in Masonic History Audie Leon Murphy is born in 1925. 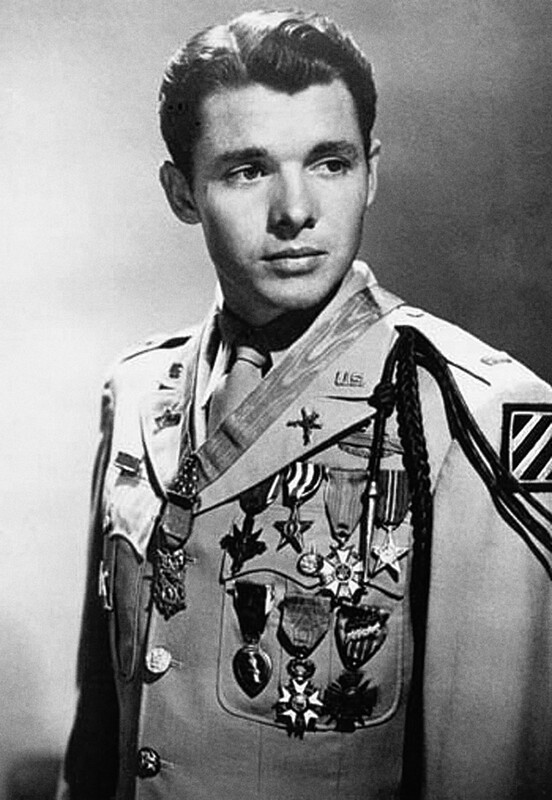 Audie Leon Murphy was an American solider and actor. Murphy was born in Kingston, Texas on June 20th, 1925. He would attend local schools and would leave school in the 5th grade to help support his family. Murphy's father had abandoned the family, leaving Murphy's mother to care for their 12 children. Murphy worked picking cotton and became skilled with a rifle. When Murphy's mother passed away in 1941, when Murphy was 16, he would use his rifle skills to help feed his siblings. In December 1941, when the United States entered World War II, Murphy was ready to sign up. Initially all the branches of the military rejected him for service because he was underage and underweight. In 1942, Murphy's sister falsified an affidavit regarding Murphy's age and he was accepted into the Army. After training at Fort Meade, Murphy would be shipped out to North Africa in 1943. He would train and help prepare for the Allied assault on Sicily. From arriving in North Africa in 1943, until January of 1944, he would leapfrog up the ranks to be promoted to Staff Sergeant. He would fight his way through Italy receiving medals and commendations along the way. In 1945, now in France, Murphy would have one of his most notable and heroic moments of the war. A German unit scored a direct hit on a M10 Tank Destroyer forcing the crew to abandon it. Murphy ordered his men to take cover in the trees while he climbed up on the M10 and using it's .50 caliber machine gun, would hold off the advancing German forces for more than an hour. He would only abandon the M10 when he ran out of ammunition. When he returned to the trees with his unit, now wounded, he directed his men to counter attack the German forces. He would remain with his men while his wound was being treated. For his actions that day, at the age of 19, Murphy would be awarded the Medal of Honor. Murphy would be the most decorated soldier in World War II. His awards would include honors from France and Belgium for his efforts in the war. From 1948 to 1969, Murphy would have an acting career. He would appear in 40 movies and one television series. Although most of his movies were westerns, he did star in the movie adaptation of his own memoirs. Both the book and the film shared the same name To Hell and Back. The rest of his life Murphy would suffer from post traumatic stress disorder because of what he went through in the war. One of Murphy's wives, he was married twice, stated that he would often cry when he saw newsreels of German war orphans, she presumed out of guilt for his actions during the war. Murphy passed away when the private plane, which he owned but was not flying, crashed in Virgina in bad weather. Murphy was a member of North Hollywood Lodge No. 542 in North Hollywood, California.